Ever needed to reboot an iPhone, iPad, or iPod touch that doesn’t have a functioning power button or a Home button? It’s tricky if not impossible, right? Even with the Assistive Touch on-screen buttons and variety of workarounds for a failed power button, rebooting an iOS device without working hardware buttons is a challenge, but it turns out that a few indirect tricks can work to get restart any iOS device, even if none of the physical buttons are working. We’ll cover two quick and easy methods to reboot any iPhone, iPad, or iPod touch – without having to use the hardware buttons at all. These methods rely on toggling software settings that initiate a soft reboot to the device, which means even if your physical buttons are completely malfunctioning, you can still restart a device if it’s necessary to. Is that easy or what? The great thing about using the Bold Fonts trick to reboot an iOS device is that you won’t lose any network settings or customizations, the only change is to the font itself. 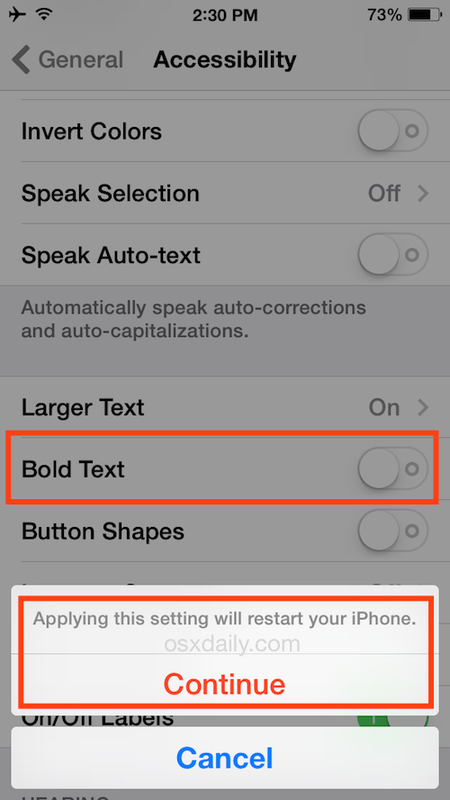 You’ll either go bold, or lose the bold text and get a narrow font, depending on your setting to begin with. This option is limited to modern versions of iOS that have the option, so if you’re working with an older device that doesn’t use iOS 7 or iOS 8, you won’t be able to use this trick, and instead you’ll want to go with method two described next. All versions of iOS offer another indirect method of restarting a device; dumping the network settings. Yea, the same trick that often resolves issues with iOS networking issues a soft reboot in that process. The device instantly reboots, without having to use any of the hardware buttons. While this works to restart all iPhone, iPad, and iPod touch devices, the obvious downside is that you lose wireless settings, so that means things like Wi-Fi passwords, VPN details, and Bluetooth connections, so be ready for that and jot down any complex logins or details beforehand. By the way, if you’re facing this issue with an iOS device that has no functioning hardware buttons, why is that? Is the device damaged? If so, you may need to pay for repairs yourself, or just deal with it. On the other hand, did the hardware buttons just fail on their own? If so, and it’s an iPhone 5, you may qualify for for the free AppleCare Repair service under the Lock Button replacement program, and if so it’s worth using that service to fix the problem. Also, it’s important to remember that all iPhone, iPad, and iPod hardware that is still within warranty from Apple will get repaired for free, assuming the problem is with the hardware and not user caused. Hey, I’m having a problem with trying to open my iPhone without a functioning home or power button. It won’t turn on and I’m unable to use it. It would really be nice if you could help me out. Thanks. How will you know if it’s completely drained? My wife’s Ipad was locked up and her home button is broke. Letting the battery drain forced a reboot and all is well. Thanks. I did this today, and it indeed brought up the slide to power off the device. Great tip! my sleep/wake button don’t work. And i tried the lock screen button in assistive touch method you said. But it says turn off. My question is will I be able to turn it back on? Mine did the same, the voice control came up as well. My iPad retina 4 suddenly shutdown, it won’t restart. I’ve held on/off button plus home start in for ages as suggested hoping it rebooted but no Apple logo seen as hoped. Totally locked up. Help! I am stuck abroad on holiday. I took it to an Apple store at Neuvo Condomina, Murcia, Spain. Apple replaced my iPad free of charge under their Apple Care warranty I’d taken out as their Genius Bar couldn’t get it to start up. My iPod 5 will not turn on, usually you can just reboot using the home and power button. But my power button is broken. How do I get it to turn on without having a home button? Thanks so much! My network made some changes which resulted in my texts being delayed and calls going straight to voicemail. They said all would be fixed with a reboot, but my home keys busted! Your advise helped a bunch and has saved me money and stress! I HAVE A BIG PROBLEM! My IPad2 power button hasn’t worked for a while now. I’ve been using assisted touch and that’s fine and dandy. However, suddenly my touchscreen isn’t working. The assisted touch opens when I tap it, but cant slide the unlock bar. I have no way of powering off… HELP! hi there, did you get an answer on how to fix your problem as my ipad is doing exactly the same thing. hi, my itouch 5th gen was half-charged and suddenly it turned off and my home button and power button aren’t working. what should i do? your help will be very appreciated. Please help me. thankyou! If your home button or power button isn’t working you can still restart your iPhone. touch isn’t working so theres no way I can get to my settings or anything and it wont turn off then back on correctly, what do I do? My iPhone 4 was working fine last night, I was holding it in my hand, and it gave two short vibrations and since then the power button has ceased to work.. I have hard reset it twice now, and no luck.. Any ideas? My ipod touch is on hang right now, and my home button is not working as well. I’m pressing the power button on the upper right of the ipod, but still it doesn’t work. Please help me find a solution for this. Thank you.. The catch is that you have to actually read the article rather than jumping to the comments to ask for a solution which is outlined in detail right above the comments. I use a MDM solution and one of our users had a lot of problems connecting to the email, our app and the MDM server. The Ipad had a broken home button and I had to look for a easy way to do reset. The “Reset Network Settings” was a life saver. Now I know a fool proof way of doing the “have you tried to turn it off and on?” and I figured that lots of problems can be solved with a “Reset Network Settings”. I need Help? Both my home button and lock button does not work and my phone is DEAD. When i charge it the iTunes logo pops up. How do i get my phone to reappear back to charging mode and back on? HELP PLEASE !! I have an ipod 5 and suddenly didn’t want to turn on, my home button is jammed so I cant press both buttons to reboot it. I heard that downloading recboot helps but it wont download on my laptop. iv tried charging it for about 3 hours and nothing. iv also heard that draining the battery helps but how will I know when the battery is drained??? please answer asap I need help now!!! Hi, my iphone 4s’ power button went bad. It wont function for days. However, just yesterday my iphone suddenly didn’t work anymore. It still rings when somebody calls but there’s nothing that appears on screen. I tried to remove the simcard but nothing happened. The phone is totally black out. Please help me, how can I fix it. Thank you. What if your screen isnt working and your power button is broken ? You should replace the faulty hardware, an iPhone without a working screen or working buttons is barely functional. The very first one that says bold text, is absolutely genius. I never ever thought of that. This page saved my phone thank you so much!! Then open the assistive touch menu and add the gesture. Now when the device freezes you can triple click the home button to turn on Assistive touch. Then go to device>lock screen and hold it until it asks you to swipe to turn it off. Then using the Assistive touch gesture you created you can now power off. The power button on my ipad does not work. I tried the reboot but still is not working. Any other suggestions? Yes! the accessibility trick worked to restart our old iPad 2 which had a broken power button – THANKS for the tip! So, my screen is frozen and my lock button doesnt work. Any tips? My iPad 2 had a 70% battery life and suddenly went off. And I couldn’t turn it on again and also I’d try to charged it but it didn’t show any signs of charging. My daughter & son set a pin lock that they now can’t remember. I need to do a hard reset but the home button is broke. What can I do?? My screen froze up but my home button doesn’t work. Apple said to hold wake/sleep button down while holding home button for twenty seconds but that didn’t and won’t work cause the home button doesn’t work. I’m stuck with a black screen.Please help. My iphone 5c has done this thing where i cant get off one screen, i can slide the notifications thing down and the other thing up but when i hold down the lock button nothing comes up. when i lock it it takes me mutiple tries to get it unlocked. my lock button doesnt work either so what do i do? How is it possible to restart your iPhone with these methods when your phone is frozen on your lock screen without the power button coming up when held down and without the normal layout e.g. time being visible? Y’all can use the RecBoot Mac OS X app (search for it on Google) to force a reboot of a device without touching the device itself. It will put the device in Recovery mode and also take it out of Recovery mode (so it can also be used in case you’ve gotten into Recovery mode by some other means). To START a phone that’s turned off and has no functioning power button just plug it into your computer’s USB and/or USB charger. It should start booting.